Croatia qualify for their fifth World Cup after following up their 4-1 play-off first-leg win over Greece with a goalless draw in Athens. 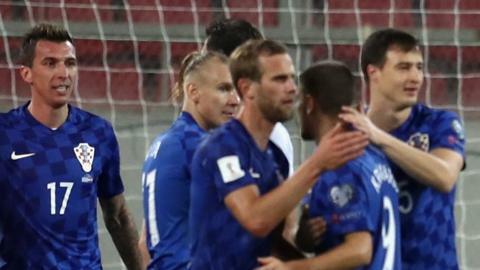 Croatia pounce on a number of defensive errors to take a commanding lead over Greece in their World Cup qualifying play-off. Northern Ireland will play Switzerland in the World Cup play-offs while the Republic of Ireland are drawn against Denmark. A holidaymaker tells of how he was savaged by three dogs while near a tourist hotspot in Athens. 5 live Breakfast bring you a guide for each of the competing teams in the 2014 World Cup. Who is playing? How can you watch the games? Who does our expert think will win? All the information you need on World Cup day eight. A complete guide to World Cup Group C, which features Colombia, Ivory Coast, Greece and Japan.